Experience the best of South Beloit, including Beloit College, Blackhawk Farms Raceway, Pearl Lake and Ledges Stables at this pet-friendly hotel. 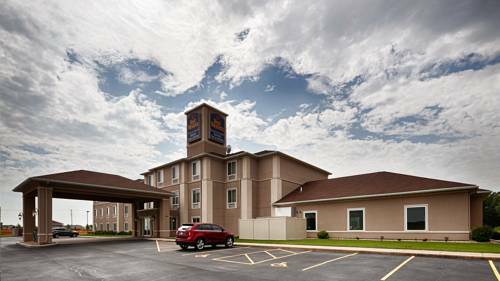 Located just a short drive from historic downtown Beloit on I-90, the pet-friendly Best Western Legacy Inn & Suites Beloit-South Beloit is conveniently located near a number of local attractions and exciting destinations. Business travelers and vacationers alike will enjoy convenient access to area attractions, such as the Ledges Stables, Blackhawk Farms Raceway and Pearl Lake, perfect for boating and lying out in the summer sun. Throughout the year, locals also enjoy Riverfest, Old Settlers Days and the Beloit International Film Fest. In addition to local entertainment, business travelers will also be pleased to find the offices of Frito Lay , Blackhawk Transport, American Aluminum Extrusion and Regal Beloit nearby, with Beloit College also drawing traveling professors and scholars to the area. A truly great stay would be nothing without comfortable amenities, and this South Beloit hotel has them in abundance. Guests can relax in modern rooms equipped with cable television including HBO , high-speed Internet access and an in-room microwave and refrigerator - plus a complimentary full hot breakfast for each guest. And for a bit of that luxurious home feeling during your stay, get a workout in our exercise room or take a dip in our swimming pool or hot tub. Make the most of your next relaxing vacation - reserve a room at the friendly Best Western Legacy Inn & Suites Beloit-South Beloit! When traveling to our destination please note that due to the newness of our property some GPS devices do not pick up our current address. As a work around please use the following address for GPS purposes: 15760 Willowbrook Rd South Beloit IL 61080. Please feel free to contact us directly at 815 389-4211 for further information or assistance. Enjoy your stay. From: Madison. Take Interstate 90/Interstate 39 East towards Chicago/Beloit to Exit 1 toward the Best Western Legacy Inn & Suites Beloit-South Beloit. Approximately 45 minutes. From: Chicago/Rockford. Take Interstate 90/Interstate 39 West towards Wisconsin to Exit 1 toward the Best Western Legacy Inn & Suites Beloit-South Beloit. Just south of the Illinois stateline From: Milwaukee. Take Interstate 43 West toward Beloit. Exit onto Interstate 90/Interstate 39 East towards Chicago. Take Exit 1 toward the Best Western Legacy Inn & Suites Beloit-South Beloit, just past the Illinois stateline. Across the street from Subway , fast food, American, open for: breakfast, lunch, dinner, open from 6:00 a.m.-9:00 p.m. Pool - Indoor pool Heated open 6 a.m. - 11 p.m. Hot tub - Hot tub, open 6 a.m. - 11 p.m.
10 mile(s) from Logan Museum of Anthropology, Beloit College artifacts from around the world. ~28 miles from South Beloit. ~43 miles from South Beloit.